Barcode Bazar is authorized seller and service provider for all TSC Barcode Printers in India. 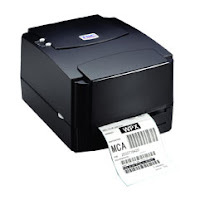 Barcode Bazar also offers Consumables – Barcode Labels and Ribbons for TSC Thermal Barcode Label Printers. TSC’s bestselling TTP-244 Plus barcode printer just got even better with the new TTP-244 Pro. The popular TTP-244 Plus thermal transfer desktop printer is known as the only inexpensive solution that offers a powerful processor, generous memory, internal scalable fonts and the world’s most popular barcode printer language emulations in one small package. The TTP-244 Pro is now 25% faster, printing at speeds up to 5 inches per second. The TTP-244 Pro is ideal for customers looking for a high quality barcode printer, coupled with low ownership costs. The TTP-244 Pro is competitively priced, comes with a two-year warranty, and accommodates a 300-meter-long ribbon, which keeps both daily and lifetime operating costs lower than other comparable printers. The TTP-244 Pro offers the largest media and ribbon capacities in its class. Unlike most printers, it can easily handle both a 300-meter ribbon and a full 8-inch OD roll of labels. With its fast 5 inch per second print speed, along with the largest memory capacity in its class, the TTP-244 Pro easily outperforms the competition.